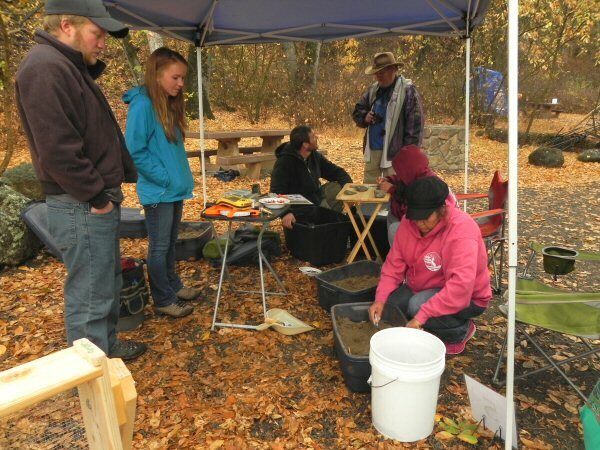 On Saturday October 17, the Bureau of Land Management (BLM) held a free public archaeology day at BLM campground at Pit 1 just off Hwy 299 between Fall River Mills and Burney. 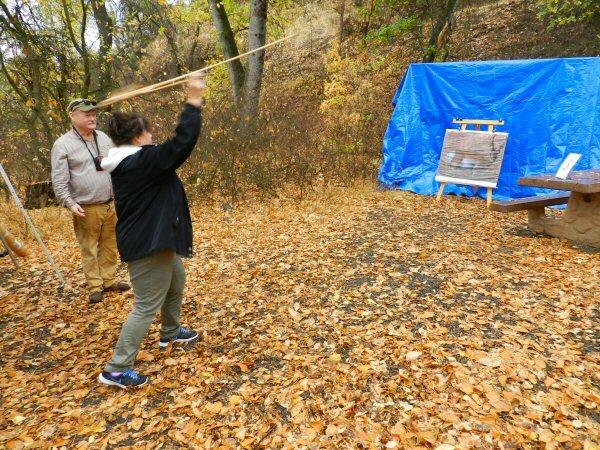 The event was sponsored as part of California Archaeology Month. Archaeology month is a national program designed to increase the public’s knowledge of our country’s past. Each state chooses a month to provide educational materials and hold events in schools and for the public to increase awareness of our archaeological past. 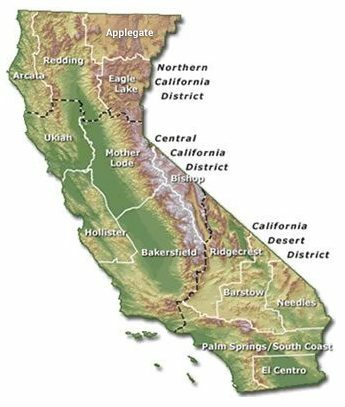 The Society for California Archaeology sponsors California Archaeology Month in October. 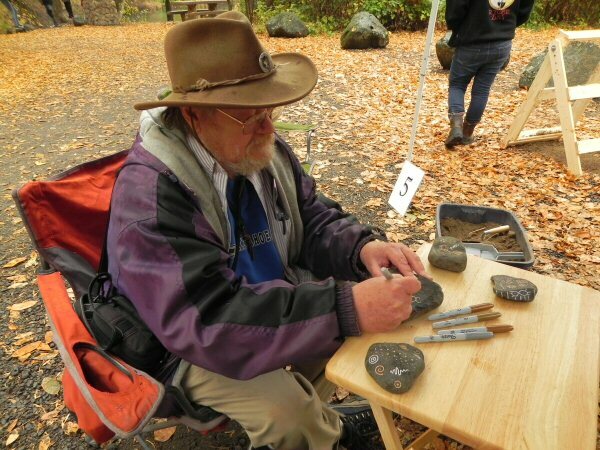 Applegate districts cooperate to hold a public archaeology day each year. The events are held in a different location rotating between the three offices. 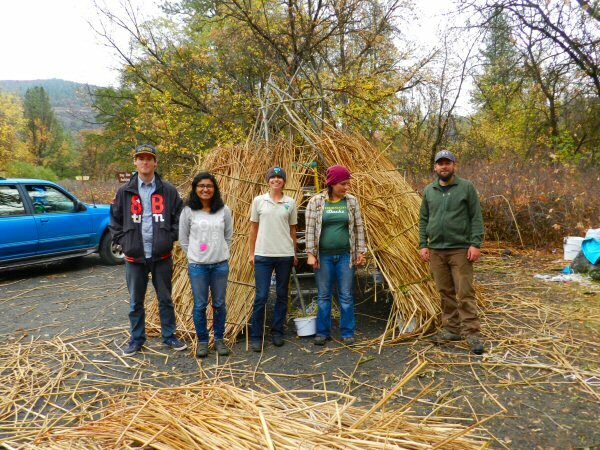 More than a dozen archaeologists, archaeology technicians, and interns from BLM, the US Forest Service (USFS) and Conservation and Land Management (CLM) volunteered there time, knowledge and expertise at this year’s event. Archaeologists David “Jack” Scott, Devin Snyder and Jennifer Rovenpera came from the Applegate Field Office, accompanied by archaeology technicians Aimee VanHavermaat-Snyder, Christine O’Neill, Jenna Matthews and Lowell Thomas. 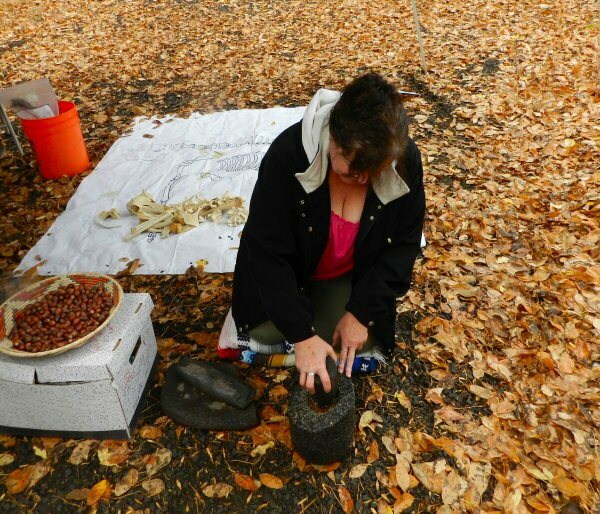 Archaeologists Sharynn-Marie Blood and Marilla Martin came from the Eagle Lake field office. 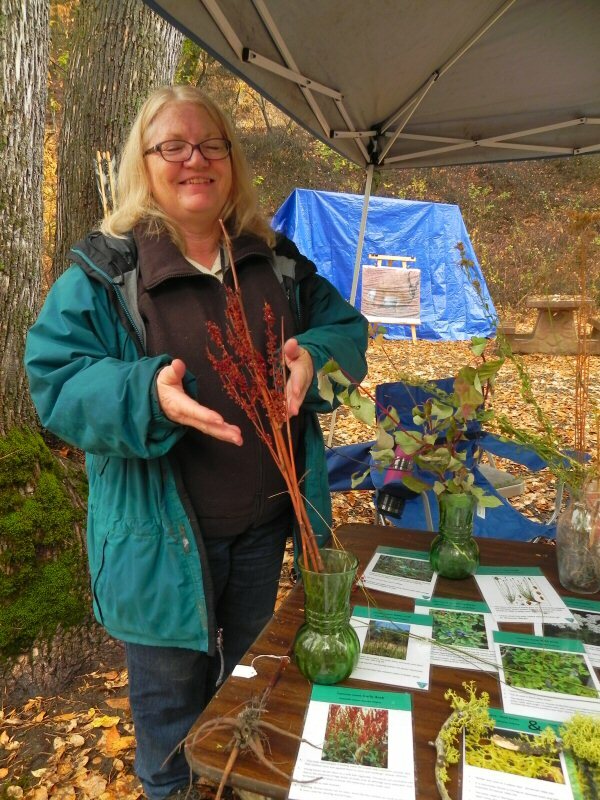 Sharynn Blood is the Program Lead for Cultural Resources at Eagle Lake. 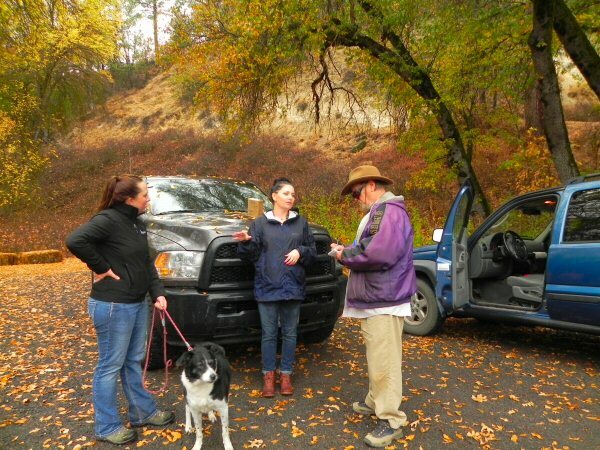 The Redding BLM field office was represented by archaeologist Eric Ritter. 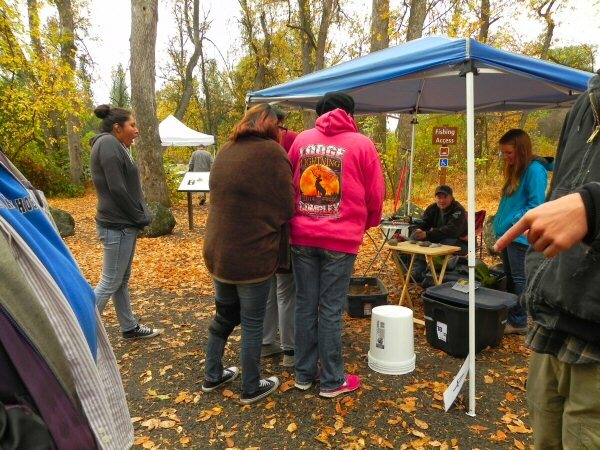 The USFS was represented by archaeologists Adam Guitierrez from the Almanor Ranger District, Alden Neel from the Hat Creek District, plus archaeology technician Jake Martin from Eagle Lake District. Two CLM interns from the Alturas Office, Jaileem Merced, and Nate Collison also staffed the event. The Pit River Tribe also supported the event and several members of the Payute tribe from Surprise Valley also came to participate. The day began with a downpour of much needed rain, but the organizers were undaunted. 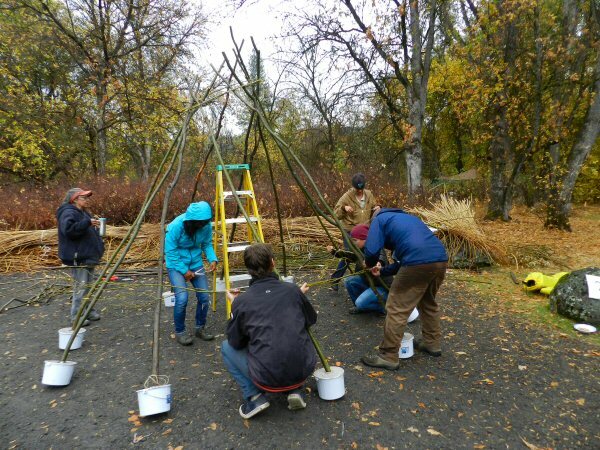 They set to work building a willow-branch frame for a traditional Northern Payute no-bi and putting up canopies under which to host educational displays for seven stations of “hands-on” learning. The stations were designed so the trained archaeologists and botanists could provide adults and children with a fun, informative experience of archaeological skills, Native American culture, and local flora. Shortly after 10 a.m., the rain stopped and visitors began to arrive. 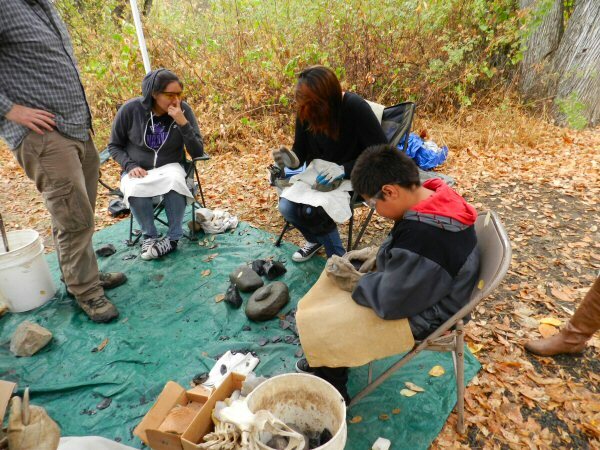 Activities included building a traditional Northern Payute no-bi, artifact excavation, atlatl-throwing, acorn-grinding, rock-art, tule-weaving, flint-knapping, working with bone tools and bone identification. Excavation skills were focused on modern-made artifacts. Visitors were advised that if they found an old artifact they should not deface it or remove it from the site. Removing an artifact from a site destroys it’s provenience and thus decreases it’s archaeological value. In order to fully understand the significance of an object it is important to know its context and location. 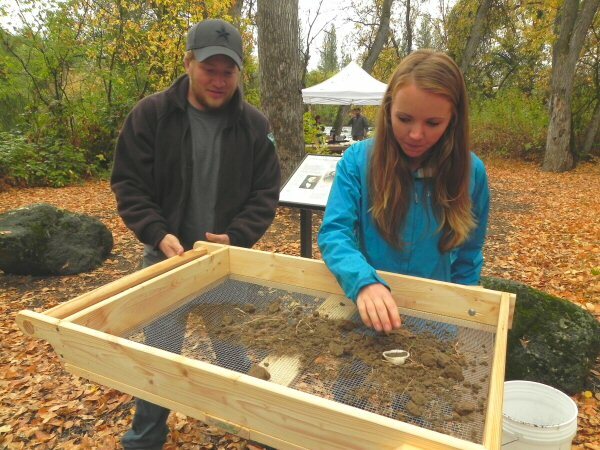 The Martins helped to explain techniques of digging and sifting for artifacts. One fun event was rock painting. There are numerous sites in Northern California where rock pictographs are found. The language of rock painting is not yet fully understood. Interpretation may involve elements of communication, artistic expression, story telling, and shamanic symbolism. Although some symbols may be universal, others are related to specific tribal nations, historical periods and geographical locations. Therefore, the insight and understanding of tribal elders and cultural officials is essential to penetrating the veil of the past. Another fun and challenging exhibit was flint-knapping. Using a heavy rock, one strikes a piece of obsidian at an angle to cause the obsidian to splinter into pieces which can then be further chipped with bone tools such as deer antler to produce arrowheads, knives and other tools. Meanwhile construction of the no-bi continued as mats of tule reed were added to the willow frame. One of the delights of the day was meeting such an interesting group of people hosting the event. 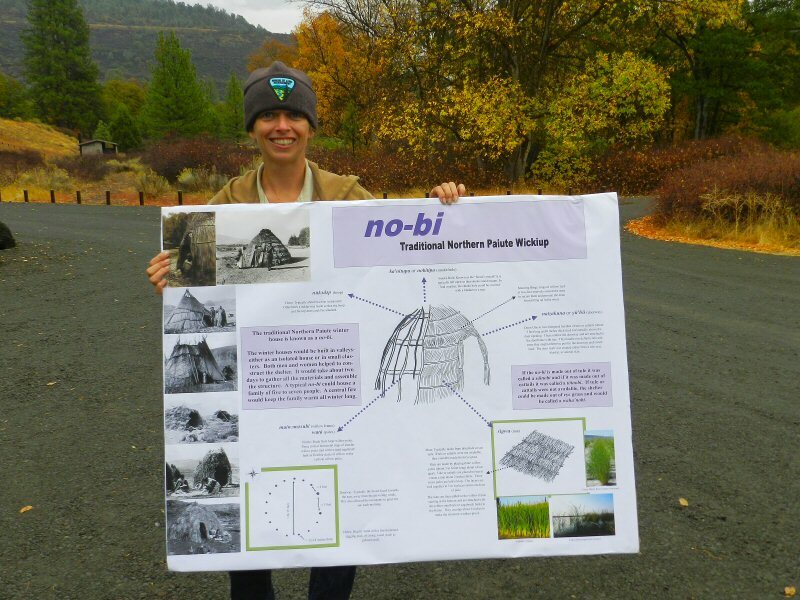 To give a few examples, Rovanpera, who spent most of the day working on and explaining the no-bi, did her master’s thesis working at a site that was thousands of years old in Northern Minnesota. Ms. Martin worked for her thesis on a site in the Caribbean. Dr. Scott has worked on several excavations in Mexico. Thomas is a musician as well as an archeology technician and thus complements his scientific training with an artist’s intuition. Botanist Merced hails from Puerto Rico and was happy to help me improve my Spanish as we talked. Everyone who attended brought their own knowledge and experience. As the day passed, conversation buzzed at each of the booths stringing together pearls of wisdom with practical experience to create a friendly bond of understanding. Speaking of stringing things together, every child who attended received a bead at each station. When they left they had a nice little bracelet symbolizing the fruit of their accomplishment. Thank you to Alex and his wife (whos name I am sorry to say I forgot) for covering the event….and to all those who participated working the stations..I learned a lot and had a great time..Thanks to all..